How Do Seals Keep Warm? There are over 30 species of seals around the world. 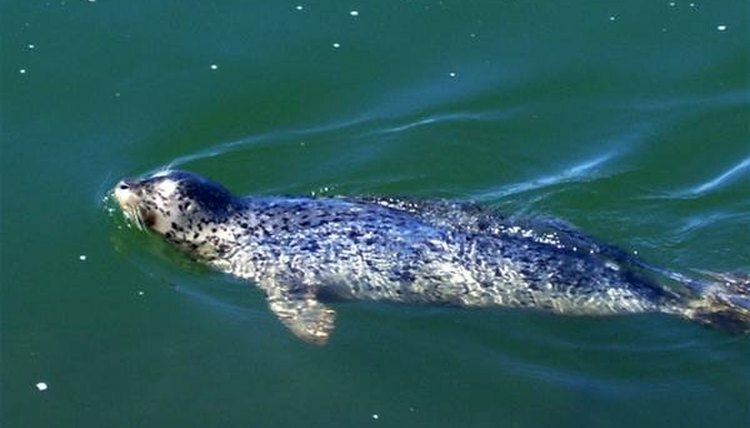 Seals live in every ocean and survive in different water temperatures. Seals are able to keep themselves warm in extremely cold ocean waters because of the way their bodies are designed. Seals are warm blooded mammals and their internal body temperatures are similar to that of humans'. A seal's body fat, skin, fur and circulatory system helps to regulate body temperature so it can survive in cold waters. Due to the efficient design of the seals' body, they are able to maintain a constant normal body temperature in cold water areas. Seals have a thick layer of fat called blubber that helps them to trap warmth in their bodies. Without this blubber they would not be able to stay warm in cold waters. The blubber acts as a form of insulation to keep their internal body temperatures warm. Seal pups grow very quickly to build a thick blubber layer so that they can survive in the cold ocean waters. The seal mother feeds her pup breast milk that contains over 50 percent fat to facilitate quick growth in the pups. If a seal's body temperatures begins to drop, its circulatory system kicks in to help keep it warm. The circulatory system reduces blood flow to the non-essential parts of the body. By doing this the blood flow is increased to the essential organs, bringing a warm flow of blood to help keep the seal's body temperature normal. Another way a seal responds when its body temperature begins to drop, is it holds its flippers tight against its body. Holding the flippers against the body stops body heat from escaping from the flippers. The flippers become like one with the body to avoid heat loss. The skin and fur of a seal helps to regulate body temperature. Seals' fur provides a layer of protection to keep them warm. Species of seals that live in extremely cold environments have a waterproof fur coat to help keep them warm. The dark skin of seals also helps keep them warm by absorbing the sun's rays. Dark colors absorb more sun rays rather than reflecting them. The shape of the seals contributes to their ability to stay warm. A seal has a small head and a large body. The large body means that the majority of the seal has an insulating blubber layer.